Here’s how Radarsign driver feedback radar signs can have a profound effect on driver behavior. “Familiarity breeds inattention” says RoadtripAmerica.com, citing inattentive drivers as the most common source of collisions. The behavior, described as “driving on autopilot” or “highway hypnosis,” is the focus of a Churchill Insurance study of drivers’ habits that reveals: On average, drivers make eight journeys on familiar routes each week. And, while traveling on these familiar routes, 46% of drivers say they are most likely to have no recollection of how they got to their destination. The study – which identifies the top “autopilot journeys” as the work commute (43%), going shopping (16%) and motorway driving (15%) – also confirms that autopilot drivers regularly break the speed limit (25%), brake too late and don’t stop at pedestrian crossings because they haven’t seen them until it’s too late. Further, 7% of motorists say they are most likely to switch to autopilot while “doing the school run” – a zone that is especially vulnerable to speeding dangers. Beta waves reflect a strongly engaged mind, active in conversation or debate. Alpha waves reflect a state of rest or relaxation (e.g. a break from work to take a walk in a garden). Theta waves reflect a state of functional daydream – the ability to complete repetitious or habitual tasks, such as driving to and from work. Converting a driver’s brain activity from a Theta “autopilot” state to a Beta “engaged” state requires a trigger — an event or interruption that is identified by the Reticular Activator (RA). 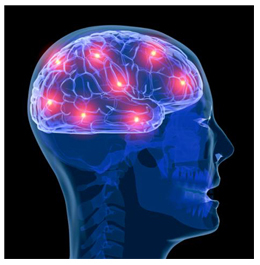 The RA is the ignition part of the brain, on alert, searching and categorizing all sensory input into categories such as familiar/connected, unusual/shocking/strange, or dangerous/threatening/problematic. Once the RA — which also controls the transition between different states — is triggered by something unfamiliar, problematic or dangerous, the brain instantly converts from Theta to Beta. Strategically placed radar speed signs can serve as triggers – stimulating the RA to identify potential “danger” – to transition a driver’s brain activity from Theta to Beta. Utilized as part of a comprehensive traffic management plan in areas classified as 1) “familiar routes” with 2) a high risk of pedestrian traffic, radar speed signs can alert drivers to pay attention. In Theta mode, drivers see speed limit signs as usual and familiar, but can be prompted into Beta mode by something unusual AND problematic, such as a flashing radar speed sign that indicates high speed. Once engaged, the driver is alert, paying attention and slowing the vehicle to a safer speed. 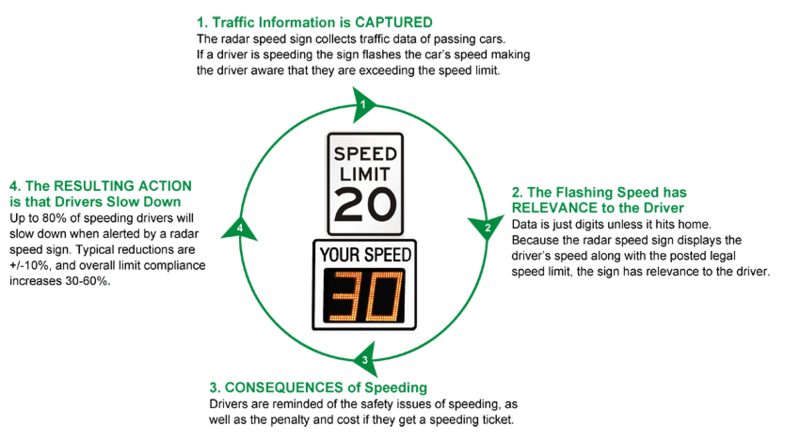 An independent speed study conducted by the City of Bellevue [Wash.] Transportation Department found that at ten locations — where radar driver feedback signs had been installed for six or more years — the speed reduction effectiveness continued to increase over time: 60% of drivers reduced speed by 10 mph. Radarsign data also confirms a consistent five mph reduction in average speeds and a 62% reduction in the number of drivers who speed more than five mph above the speed limit. More than two years after installation, data indicates a long-term shift in driver behavior (Alpharetta, GA location — comparing week 1 data with week 109 data).